Right before the final fight, we see Loki and Stark discussing the terms of the upcoming battle, bantering back and forth between who will win. It is then that Loki gets the idea of turning Stark against his comrades like he did with Hawkeye, as well as a bunch of other S.H.I.E.L.D. agents at the beginning of the movie. But, it doesn't work at all. Is this because of Stark's Arc Reactor countering the Cosmic powers somehow, because Stark is incorruptible (which doesn't make much sense), or possibly because simply he was touching the Arc Reactor and not Stark's flesh? Either way, is there an explanation of why this did not work on Tony? When Loki tries to take control of Stark he actually hits the ARC reactor and not the flesh over his heart. Your graphic explains it best with the "Tink, Tink" sound showing that Loki is actually hitting the metal of the reactor. In the Avengers director commentary, Joss Whedon states it fails to work because the ARC reactor prevents the staff from reaching Tony's heart. Remember: Stark's father was studying the power of the cube. In Iron Man 2 he said only Tony could accomplish the creation of this new particle. It could have been a tesseract particle of some sort that Tony made with his new reactor. 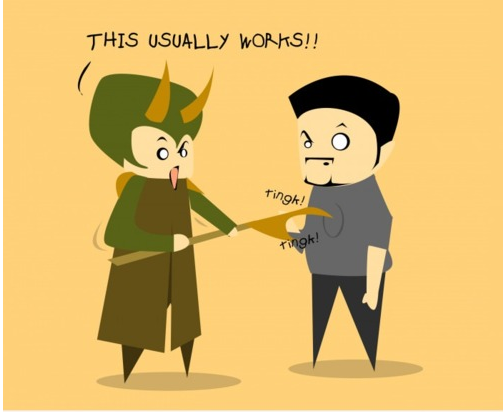 This could be why the spear of Loki didn't affect Stark. Just the same as the spear could affect the closing of the portal. While someone else provided an answer straight from the director, I am rather fond of the idea that the Infinity Stones do not work against each other. Erik Selvig tells Black Widow that the scepter can be used to disable the portal because "Loki's scepter, the energy...the Tesseract can't fight. You can't protect against yourself." That sounds like the stones' powers do not work against each other, and therefore the shield will not stop the scepter. The space stone's shield does not work against the mind stone, and we see Black Widow breach the Tesseract's (space stone's) shield with the mind-stone-powered scepter. The stones do not work against each other. Recall in Iron Man 2, Tony uses his father's research on the Tesseract to create a new element to power his arc reactor. So in his chest is an arc reactor powered by an element derived from the space stone. When Loki tries to use the mind stone's mind control powers against a space-stone-powered Tony, it likewise fails. The stones do not work against each other. When the stones go up against each other, their powers fail. The shield does not work against the mind-stone-powered scepter, and the mind control does not work against a space-stone-powered Tony. Even though the Spear and Cube are known as mystical and magical items, they are used to tap into a source of almost universal convertable energy. An energy similar to the emitted power generated by the Arc Reactor. The two energies, if not even the same seem to interfere each other. It is known that the Arc Reactor is able to store and absorb large amounts of energy. So it is possible that it absorbed the low frequency energy normally used to correspond and control the victims brain patterns. As seen the Arc Reactor is not only touched by the spear/scepter but it's attracting it in a magnet-like manner. In my opinion the reactor is emitting an electromagnetic field that is attracting the spear as well as interfering the energy projection which is causing the spear's ability to control the victim's brain patterns. Now that we know it's an infinity gem I believe that Tony's reactor made of the new element (Iron Man 2) is interfering with the mind gem. Proof of this is in the scene when the avengers are arguing about Shield's intent for the teseract and Banner grabs Lokis staff. When everyone is arguing Stark notices something's wrong. The only reasoning he's arguing is because... Well he's Tony Stark. The mind gem has no control over Tony. Why didn't Loki realize he is touching the arc reactor? Why was this version of the Stark vs Loki scene abandoned? Why was Tony Stark so sure that Banner would return to fight? How did Strucker transport the Chitauri whale corpse/skeleton from NYC to Sokovia? Why didn't Thor take Loki's sceptre at the end of The Avengers?